1.Any of numerous aquatic or terrestrial mollusks of the class Gastropoda, typically having a spirally coiled shell, broad retractile foot, and distinct head. 2. 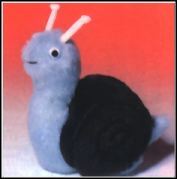 A slow-moving, lazy, or sluggish person. 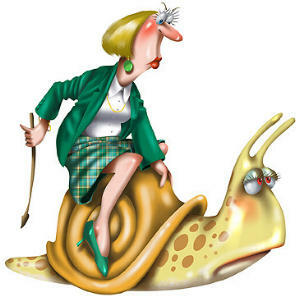 Snails move by means of a wavelike series of muscular contractions along the bottom of the foot. 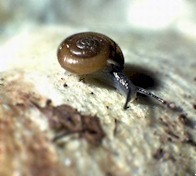 This motion is often aided by cilia and, in land snails, by a track of laid-down slime. Snails feed mainly on algae and decaying matter and are important members of the food web, being a source of food to fish and waterfowl. 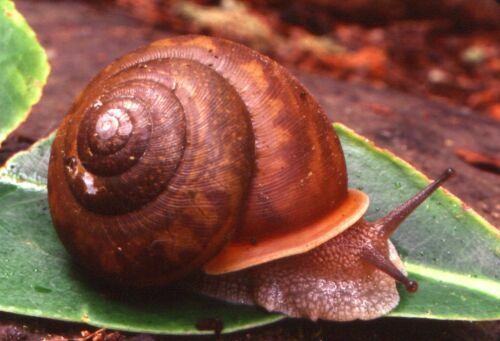 A snail browses by means of a radula, a ribbonlike tongue often containing many thousands of denticles, or teeth, that are projected from the mouth opening and drawn along rocks or leaves. 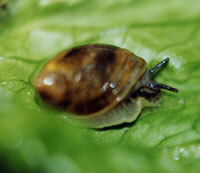 Some carnivorous snails have radulae that bore holes through the shells of other mollusks to reach the soft flesh. Many species of snails are hermaphroditic and capable of self-fertilization. After the escargot have passed a fasting period for 5 or 6 days in wooden boxes (never in plastic unless they have a bottom well ventilated, the objectives of which is to make them dry) they should be washed in running water or with a garden spout. Next they are put in a big container a layer of escargot with a hand full of rock salt. Follow this with another layer of escargot and another hand full of rock salt, etc. The escargot will issue a lot of foam in what is called disgorging themselves. We braise them for a while and then wash them again very carefully before scalding them. Shells are composed of several different layers. The thin outer layer (periostracum) consists of an organic substance known as conchiolin. Below the conchiolin there is a much thicker inorganic layer composed of three layers of crystalline calcium carbonate which was formed on an organic matrix. The innermost layer nacre (or mother-of-pearl), is best seen in marine molluscs, only traces of it are to be seen in 'non-marine' molluscs.